These things are actually quite related, though I understand how it might not appear to be that way at first. 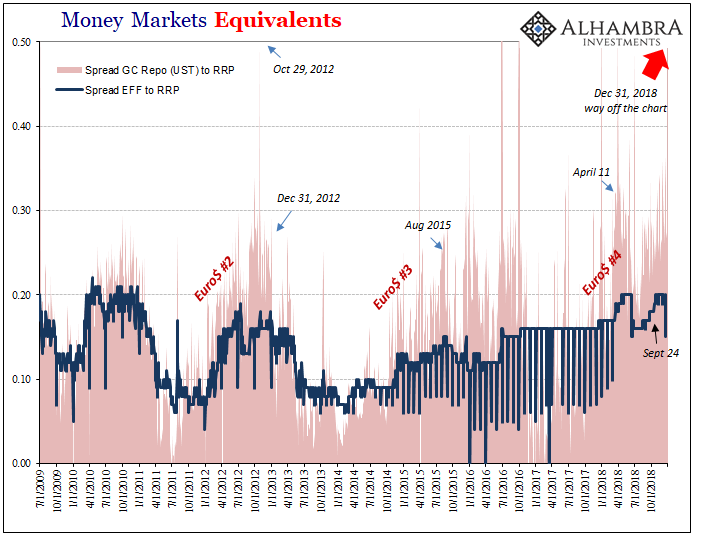 As noted earlier today, the Fed (yet again) proves it has no idea how global money markets work. They can’t even get federal funds right after two technical adjustments to IOER (the joke). 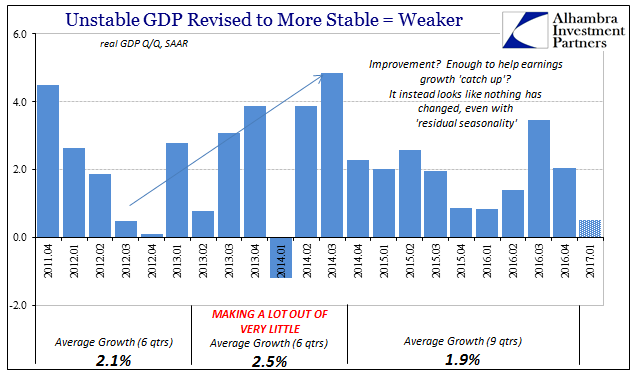 Quick review: stocks hit a bit of a rough patch right during the height of inflation hysteria. At the end of January 2018, just as the US unemployment rate had finally achieved the very center of attention, global markets were rocked by instability. Unexpectedly, of course. 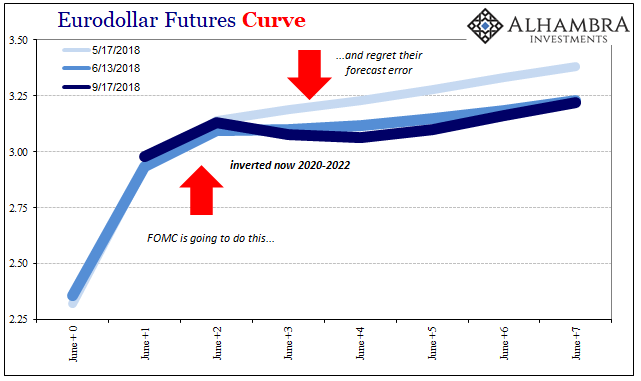 Nothing the Fed did today, or has done up to today, has changed the curves. 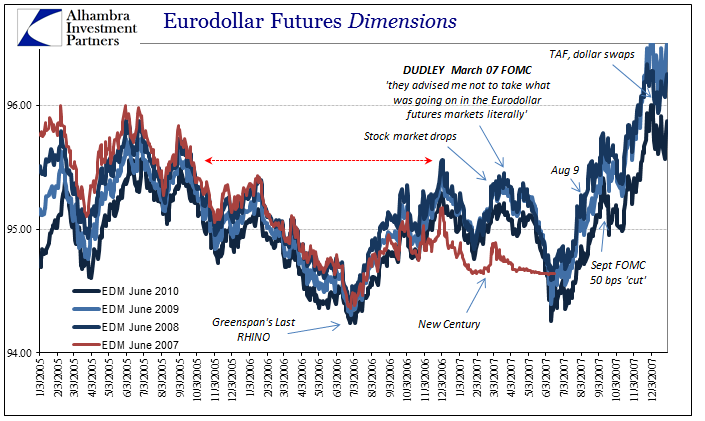 Eurodollar futures and UST’s, they are both still inverted. The former sharply inverted. 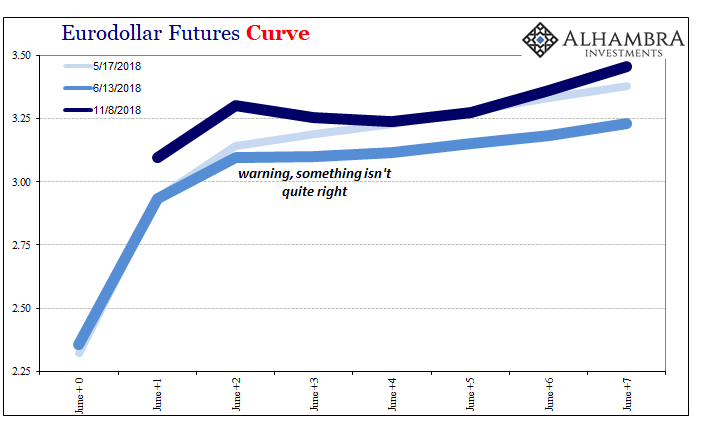 The only thing that has changed since early January is the narrative – and not in a charitable way. It is treated as a positive when it is a pretty visible signal about deteriorating circumstances. Men have long dreamed of optimal outcomes. There has to be a better way, a person will say every generation. Freedom is far too messy and unpredictable. Everybody hates the fat tails, unless and until they realize it is outlier outcomes that actually mark progress. The idea was born in the eighties that Economics had become sufficiently advanced that the business cycle was no longer a valid assumption. 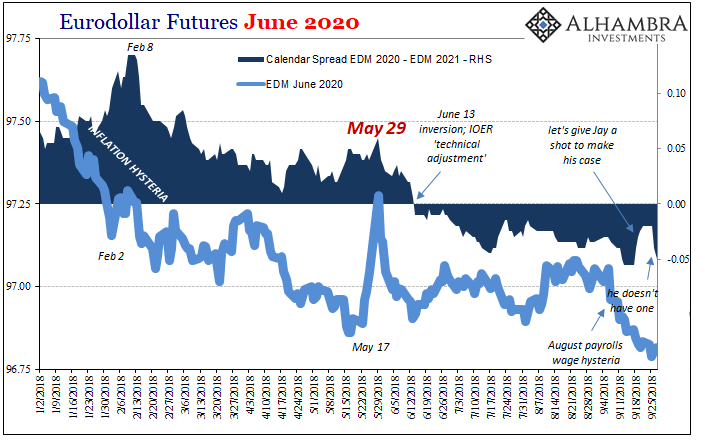 I’m going to break my personal convention and use the bulk of the colors in the eurodollar futures spectrum, not just the single EDM’s (June) contained within each. 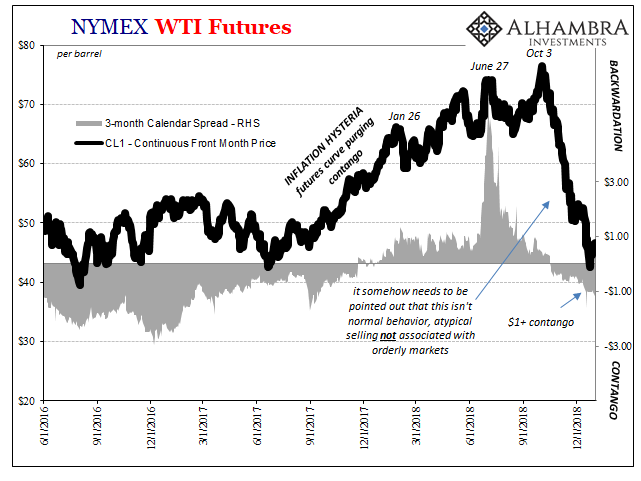 The current front month is January 2019, and its quoted price as I write this is 97.2475. The EDH (March) 2019 contract trades at 97.29 currently and it will drop off the board on March 18. There’s no sign of inflation, markets are unsettled, and now new economic data keeps confirming that dark side. Forget each month, every day there is something else suggesting a slowdown. That much had been evident across much of the global economy, but this is now different. The US has apparently been infected, too, not that that is any surprise. 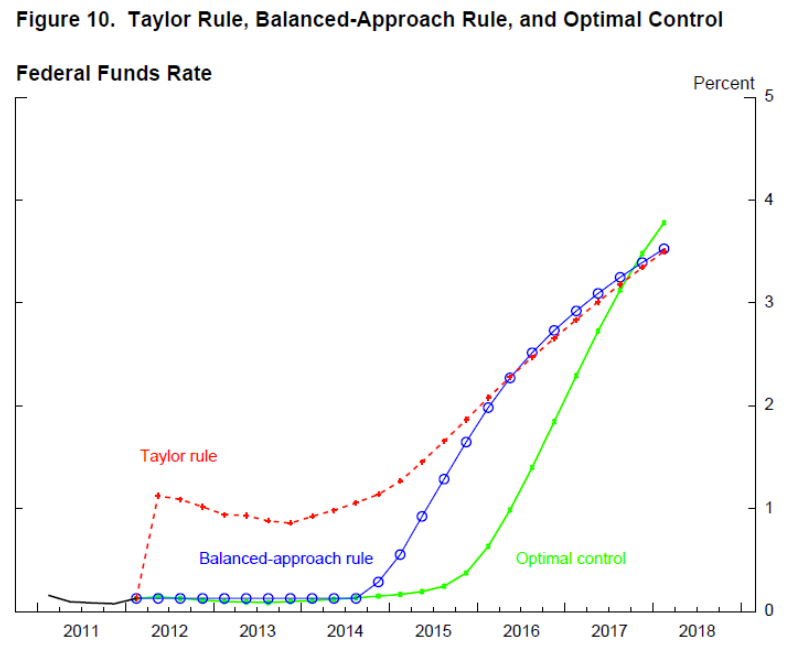 For Janet Yellen, during her somewhat brief single term she never made the same kind of effort as Ben Bernanke had. Her immediate predecessor, Bernanke, wanted to make the Federal Reserve into what he saw as the 21st century central bank icon. 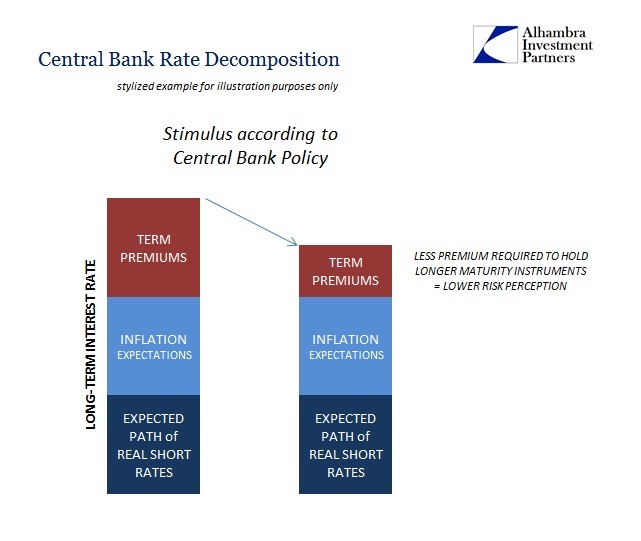 Monetary policy wouldn’t operate on the basis of secrecy and ambiguity. Transparency became far more than a buzzword. Cushing, OK, delivered what it could for the CPI. The contribution to the inflation rate from oil prices was again substantial in August 2018. The energy component of the index gained 10.3% year-over-year, compared to 11.9% in July. It was the fourth straight month of double digit gains. We’ve been here before. 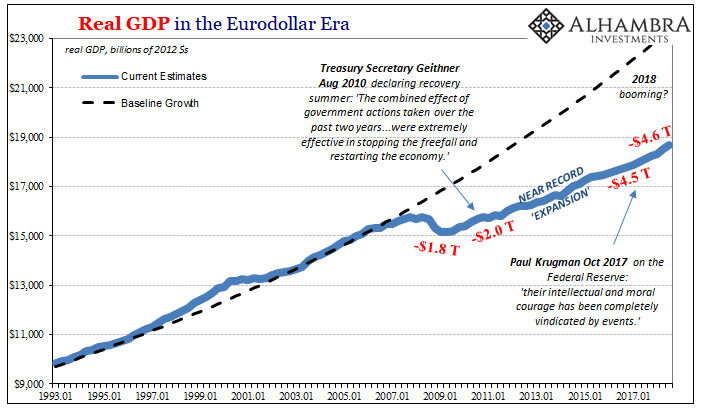 Economists and central bankers become giddy about the prospects for success, meaning actual recovery. For that to happen, reflation must first attain enough momentum. 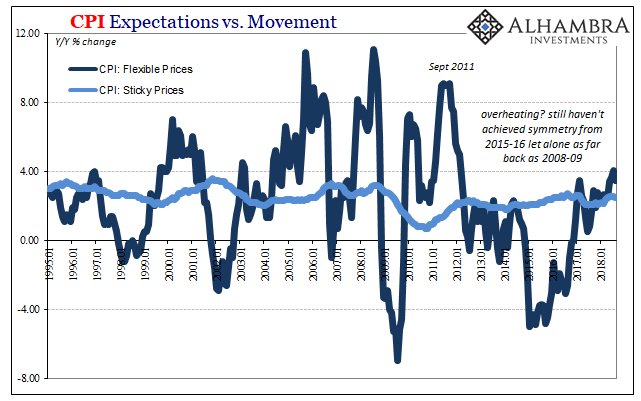 If it does, as is always forecast, reflation becomes recovery. The world then moves off this darkening path toward the unknown crazy. 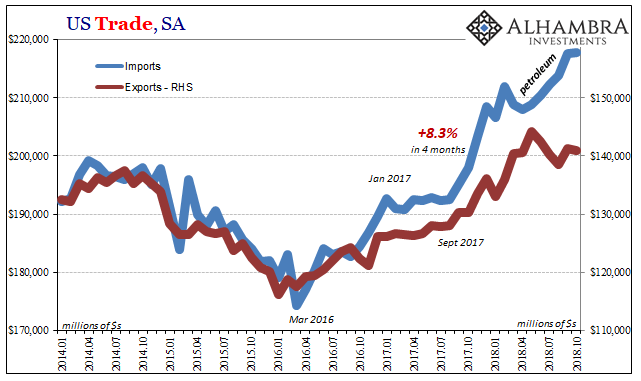 There is a difference between reflation and recovery. The terms are similar and relate to the same things, but in many ways the latter requires first the former. 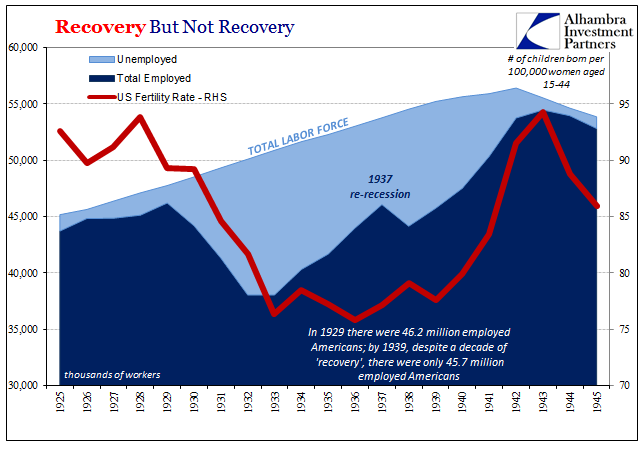 To get to recovery, the economy must reflate if in contraction it was beaten down in money as well as cyclical forces. 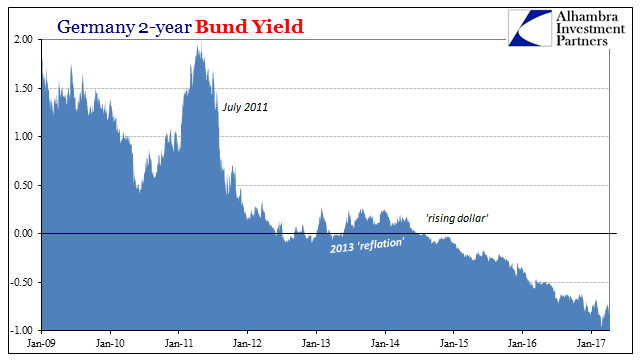 In the Great Crash of 1929 and after, reflation was required because of the wholesale devastation of the money supply. 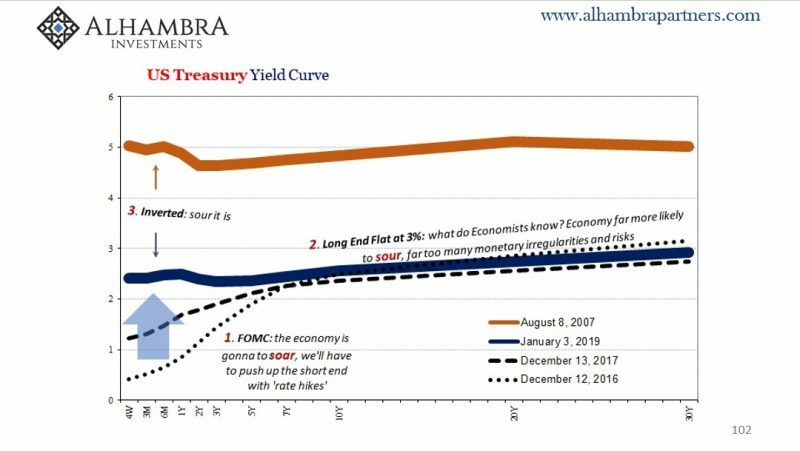 In October 2015, Federal Reserve Vice Chairman Bill Dudley admitted that the US economy might be slowing. In the typically understated fashion befitting the usual clownshow, he merely was acknowledging what was by then pretty obvious to anyone outside the economics profession. 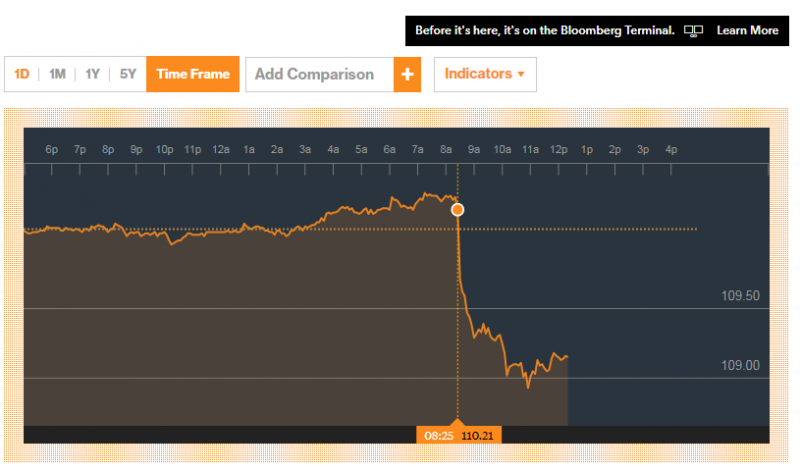 Today started out very badly for the FOMC. At 8:30am the Commerce Department reported “unexpectedly” weak retail sales while at the very same time the BLS published CPI statistics that were thoroughly predictable. 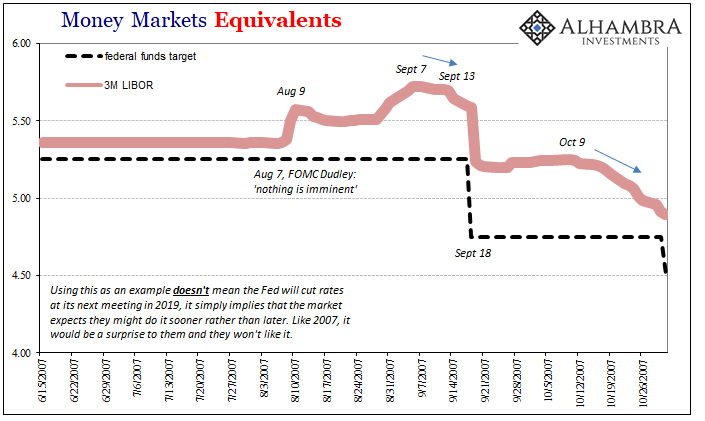 Markets, at least credit and money markets, have gained a clearer idea what the Fed is actually doing and why. It’s not at all what the media suggests. As I so often write, we still talk about 2008 because we aren’t yet done with 2008. It doesn’t seem possible to be stuck in a time warp of such immense proportions, but such are the mistakes of the last decade carrying with them just these kinds of enormous costs. If you are a stock investor, you should be terrified. The most disconcerting words have been uttered by the one person capable of changing the whole dynamic. After spending so many years trying to recreate the magic of the “maestro”, Ben Bernanke in retirement is still at it. Bundesrepublik Deutscheland Finanzagentur GmbH (German Finance Agency) was created on September 19, 2000, in order to manage the German government’s short run liquidity needs. GFA took over the task after three separate agencies (Federal Ministry of Finance, Federal Securities Administration, and Deutsche Bundesbank) had previously shared responsibility for it.